We recently went to Cape Cod for a wedding, and took advantage of our presence in the Bay State to visit some of our friends! Flight schedules prevented me from attending Alison's book signing at Webs, but I did get to see her for a few minutes before she dashed out the door. And look what she had for me! 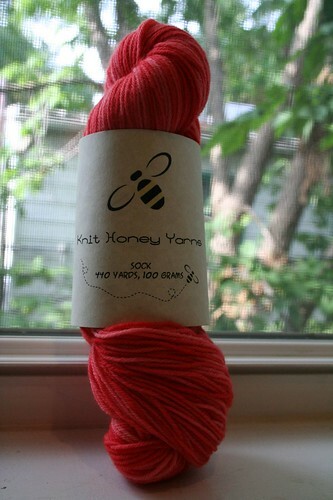 That's right, it's the yarn from the dearly departed knee-socks! I had forgotten that she also snagged a skein for herself, and thanks to her largesse, the knee socks will live again! Long live the knee socks! It's Claudia's Handpainted yarn knit up in Conwy from Knitting on the Road. 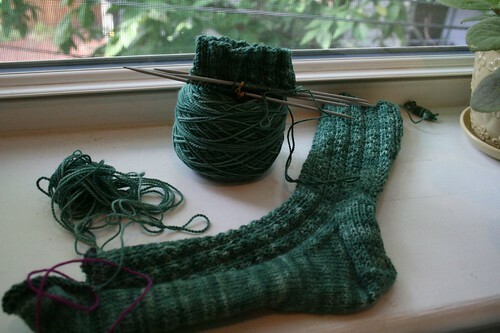 Though I would have loved to try one of the lacy patterns currently popular (like Monkey or Pomatomus), my pal suffers from perpetually cold feet. Can't have that! Conwy is all about mock cables and dense, cozy fabric. I hope she likes them!